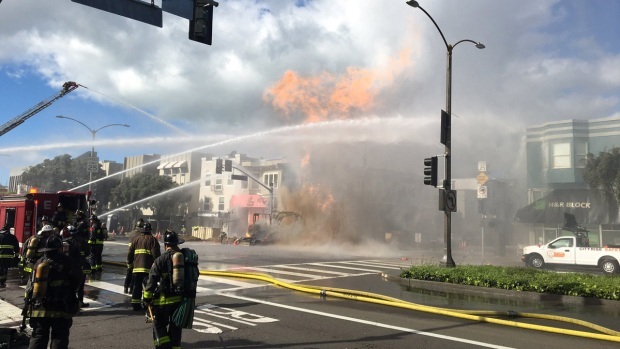 Massive flames from a gas explosion destroyed five buildings in San Francisco's busy Geary Boulevard Wednesday afternoon — including a popular Chinese dim sum restaurant — and prompted evacuations within a one-mile radius of the fire zone but resulted in no injuries, firefighters said. Pete Suratos reports. Massive flames from a gas explosion destroyed five buildings in San Francisco's busy Geary Boulevard Wednesday afternoon — including a popular Chinese dim sum restaurant — and prompted evacuations within a one-mile radius of the fire zone but resulted in no injuries, firefighters said. PG&E crew finally shut off the flow of gas more than two hours after the blaze began, leading many to question why gas lines hadn't been shut down earlier. The fire ignited after a third-party construction crew ruptured the gas line. The crew was from a company called MasTec, and a spokesman said it is investigating the incident. The National Transportation Safety Board will also investigate the natural gas explosion. NTSB spokesman Eric Weiss said Thursday that an eight-person team will travel to San Francisco and that it will release information as it becomes available. The explosion occurred around 1:20 p.m. at a construction area near Geary Boulevard and Parker Avenue, according to the fire department, and the flames quickly spread to five buildings nearby. Eight missing workers were located and reportedly uninjured, San Francisco Fire Chief Joanne Hayes-White said. "It’s pretty dramatic, but we have pretty good handle on it," she told reporters in the early stages of the fire. A third-party crew was working on fiber optic wiring underground in front of Hong Kong Lounge II when they hit a gas line, which sparked the explosion, according to Hayes-White. The building in which Hong Kong Lounge II is located is more than 100 years old, according to property records. The restaurant has made it to many "best of" lists and is frequented by tourists and students from the nearby University of San Francisco. 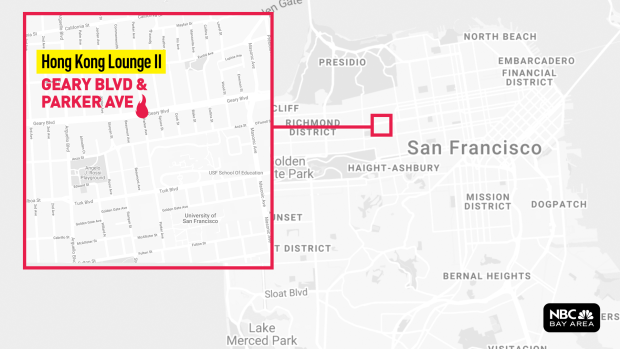 The blaze took out power for at least 2,500 customers in Laurel Heights, Inner Richmond and parts of the Presidio, according to an outage map provided by Pacific Gas and Electric. All electricity has since been restored. At least 300 customers were still without gas service as of Thursday morning, the utility said. Repairs to the gas line have been completed, but crews are still working to flush water out of the line so gas can be reintroduced. "We know it's cold ... We are working to fix it," a PG&E spokesperson said. Firefighters kept the fire under control while two separate crews manually dug into the streets in an attempt to shut off the gas lines. "We are working closely with first responders," PG&E said in a statement. "We will communicate more as information becomes available." Later, a PG&E official said his crews had to isolate the situation and develop a plan due to a "complex web of utilities" under the streets. Then, he said, the crews had to "hand dig" to reach the affected line and cap it, he said. San Francisco supervisors came under fire after PG&E took nearly 3 hours to shut off the gas in Nov. 2017, last time there was a gas explosion in San Francisco. PG&E's map of its gas lines show that there are no transmission lines in the area of the explosion. NBC Bay Area investigative reporter Jaxon Van Derbeken said the damaged gas line is "likely a distribution heater main, which is a more intense line than a regular transmission to households." Footage from the scene captured towering flames erupting from the gas line in the street in front of the restaurant. Witness Sarah Arnold usually works across the street but wasn't at the office Wednesday. "It's pretty scary. I could have been there working today, and I wasn't," she said, adding that she heard all her co-workers were OK. "I was just on my way to Trader Joe's and saw the flames." Joseph Feusi lives four blocks away and said he was awoken by what sounded like a jet engine. Feusi, who works nights and sleeps in the afternoon, said he could see the towering flames from his home. "I think the eight guys are really lucky they didn’t get blown to bits," he said. PG&E stressed that the workers who cut the gas line are not affiliated with the utility, which is under heightened scrutiny over its natural gas pipelines. A PG&E pipeline exploded under a neighborhood south of San Francisco in 2010, killing eight people and wiping out a neighborhood in suburban San Bruno. A U.S. judge fined the nation’s largest utility $3 million for a conviction on six felony charges of failing to properly maintain the pipeline. California regulators also fined PG&E $1.6 billion and the utility remains under a federal judge’s watch in that case. For those displaced by Wednesday's explosion and fire, the American Red Cross said volunteers will be opening an overnight shelter at 6 p.m. at St. Mary's Cathedral, 1111 Gough St.